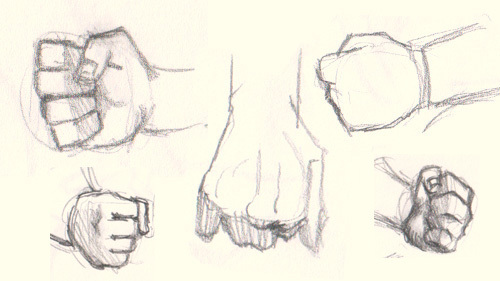 How to draw fist 5 different ways. This video shows you how to draw fist hand 5 different ways. The tutorial is easy to follow for all level. You can scroll down further to see step by step tutorial. In this tutorial, I will show you the easiest way possible to draw fist for you to implement in Manga or comics. It is always easier to break down complex object into simple shapes. By logically analyzing the object and break it into simple shapes and forms, you can basically able to draw everything possible. 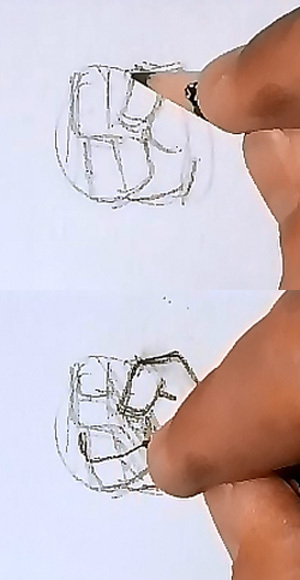 Here are some images of the process of how I draw fists step by step below. 1) I start off with simple square shape. 2) I then add a rectangle shape on top as a rough shape for a thumb. 3) Add two more rectangle inside the initial square, top one serves as a rough guideline for index and middle fingers. The bottom one serves as a guideline for ring and pinky fingers. 4) Then draw a vertical line cross both of the smaller rectangles. As they indicate the pivot point on fingers. 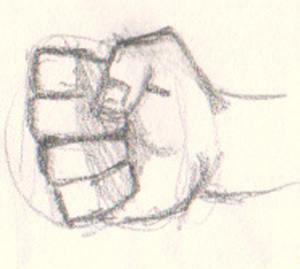 5) Add shading as shown and refine the shape of the thumb.